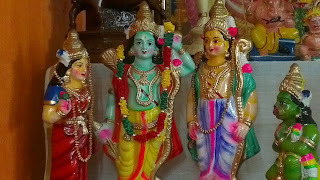 Here comes Navratri 2012 at our home, though at a delay of three days. It was supposed to start on Oct 16th. But, at our home, as my people were out of station, we declared holiday for Durga Devi (The first three days are dedicated to Goddess Durga) and Lakshmi Devi and Saraswathi Matha came here yesterday night. 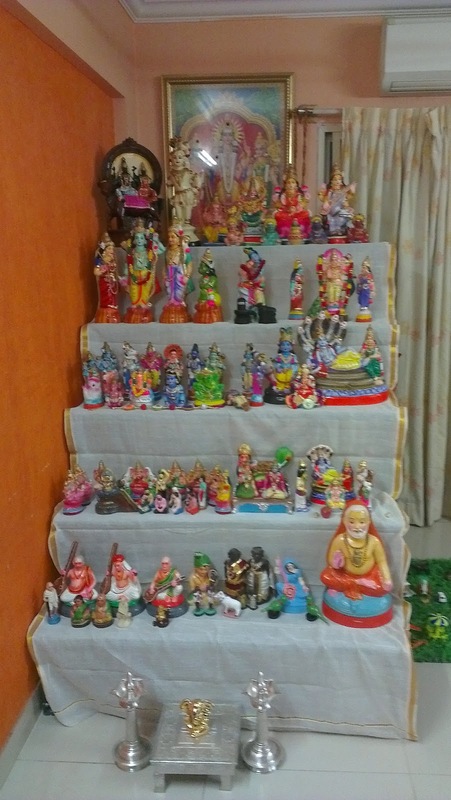 So, with myself and my daughter dear in tow, I started with the task of assembling the Golu steps and placing the Golu "Bommai-s". I had outsourced the task of assembling the iron steps to the electrician of our apartment. He promptly came at 6 PM yesterday night and started assembling the steps with a disclaimer that “Madam, I am an L-board at this. So, please help me and bear with my mistakes”. And there we were, putting our minds into action and somehow completely assembled the steps (Though with a couple of rectifiable mistakes that we committed). 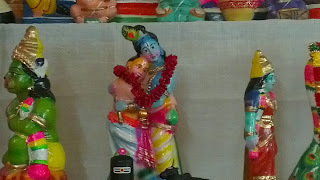 And all this while, my daughter dear was very co-operative and did not pose any threat to us J by doing stunts with the steps. She was watching cartoon, helping us also (by tightening the nuts and bolts, though her level of strength did not co-operate for that). So, after an effort of 2 hours, we finished the assembly. 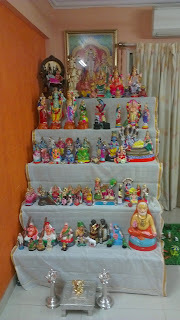 And then started the laborious task of taking out the doll cartons from the loft, opening them, open the wrapped dolls (there are around 100 dolls) and assemble them in a particular order on the steps. The electrician left and my daughter was super-excited at the word of “dolls”. I had to really negotiate with her to convince her that we will keep the dolls after both of our dinners are over. So, she was patient enough and I was glad enough. So, the assembling of the dolls and the cleanup took another 1.5 hours. It was 10.30 PM when we hit the bed. My daughter was super-tired and was starting to get cranky due to all the doll excitement. She told the steps with the dolls on them were looking niceJ.. The fruit after the effort….